I love blogging to classical music at night. It's just enough of a distraction, without clouding my mind. My thoughts flow in a way they couldn't during the day and the beautiful combination of strings and piano make me feel calm and peaceful inside. I'm a huge fan of the French composer Claude Debussy, hence my Debussy-loaded playlist. However, I'm in serious need of branching out and for whatever reason my memory is failing me and I can't remember all the specific pieces I love (there was a particularly compelling Chopin Nocturne I can't for the life of me remember). P.S. 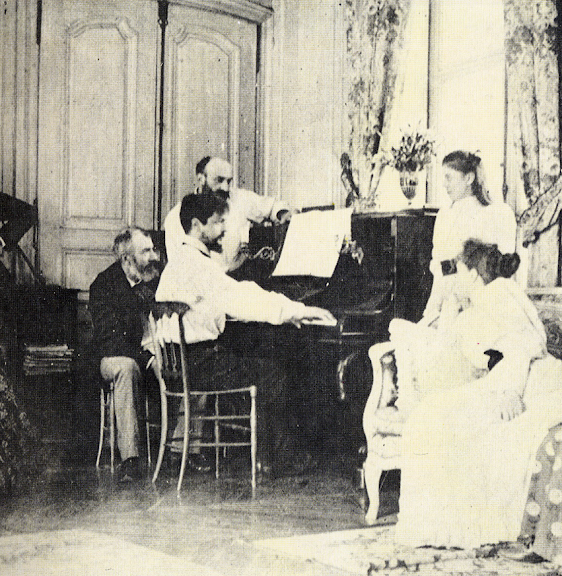 If you are also a Satie fan and visit Normandy at some point, make sure you stop by the Maison Satie in Honfleur. The town is absolutely lovely and this small museum provides an atypical museum experience you'll truly enjoy. Mozart: Variations On Ein Weib Ist Das Herrlichste Ding, K 613. I love all of the Mozart adagios...they are moody and relaxing. Also one of my favorites is a version of "Nessun Dorma" that the BBC Concert Orchestra has done. One of my all time favorites. Sorry for such a long comment, music questions just strike a cord with me. I was just going to comment that one of my favorite albums is Romance of the Violin. Marilyn mentioned it too. Oh my, Joshua Bell can play the violin. The Swan is my absolute favorite on this CD. Have you ever listened to J.S. Bach's Cello Suites? They are moody and lovely and spare. We particularly like 1, 3 & 5 and BWV1007, 1009 & 1011. One more comment, then I'll stop... I completely second the Pride & Prejudice soundtrack by Dario Marionelli -- one of my ABSOLUTE FAVORITES. I also love the Joshua Bell's 'The Kreisler Album', another all-time favorite. You can create a Pandora.com station for Debussy or other major composers you like. It looks like you like music from the Romantic period. You will LOVE Chopin - any piano solos. Try his waltzes, especially. You will fall in love. See, I knew you all would have some great input! Thank you, thank you. I'll download a few more tonight on itunes. I found your blog via Caroline. Very darling. I would have to list Debussy near the top or at the top of my list too. I love Estampes- the whole set is so descriptive. Have you ever listened to Maurice Ravel? Some of his music has a darker tone to it than Debussy, but very beautiful. He is also categorized with Debussy as "Impressionistic"- though Ravel is more neoclassical. Check out his Sonatine. I'm so glad you created the list. I created a Debussy station on www.pandora.com and it's playing right now. Perfect music for being on the computer before getting ready for bed. Thank you!!! Dvorak's New World Symphony is a fave - particularly the 2nd movement. I also love all Chopin Nocturnes.